Once in a while a product you would call a game changer hits the market. Everyone is talking about it, sharing their opinions, for and against. And, this is exactly what happened when Garmin released their innovative digital bow sight, the Xero A1i, at this year’s Shot Show in Las Vegas, USA. Michael from Hunt My Passion has taken the Xero A1i to the test in the following review. As a group, bowhunters are all very different. Some are quick to adapt to new, interesting and technologically improved products. Others take pride in sticking to the good ol’ tried and tested. And with its advanced features, the Xero A1i is a bow sight that has the potential to divide opinions even more. Especially in relation to the digital shift, it presents to the sport. This product is right at the centre of the discussion about where bowhunting is heading. So when the Monocular contacted me to ask if I wanted to test the Garmin Xero A1i and give my honest opinion, I said yes. The bow sight combines the traditional multi-pin sight with a laser range finder capable of ranging up to 275 metres away on stationary objects. When ranging within up to a 100 metres of non-reflective targets, like game, it provides an exact LED pin for the ranged shot. This pin will be calculated almost instantly and take into account the exact angle and distance to the target. All this is initiated with the press of a single trigger button mounted on the handle. The trigger is silent and can be mounted wherever you find it most useful on your bow. The correct placement of the trigger button makes you able to measure the distance to any given target countless times while the bow is drawn. This saves the archer from a lot of estimations and guesswork especially when hunting, but does it actually work? Built-in rangefinder with angle compensation. Removing the need for a handheld rangefinder as well as making it easier to take very angled shots. Option to save and load a range of different arrow profiles. Making it easier to go from practice shoots to the hunting grounds. Unobstructed viewfinder due to the use of LED pins rather than conventional physical pins. Single button press to switch from a ranged shot to fixed LED multi-pins adjusted to preferred distances. With a little scepticism and a lot of curiosity, I started unboxing. The first thing in noticed was the great design and build quality. It’s obvious that this is a product Garmin has spent a lot of time and energy getting just right. The AAA-batteries I needed were not included, but once I obtained a pair, I was ready to begin mounting the sight to my Prime Centergy bow. On that note, always use lithium batteries. The laser needs high power batteries to function properly. Mounting the Xero A1i was as straightforward as with a regular multi-pin bow sight. So too was the adjustment of elevation and windage. Now it was time to mount the single button trigger which makes it possible to use the rangefinder effortlessly, either raised at full draw or at ease when spotting. The trigger on the Xero A1i is silent so you can use it multiple times in a single draw. This is a very practical feature if your target is moving around and the distance and/or angle changes. Oftentimes the shot situation can even change between range finding and drawing the bow. Having access to an exact measurement all the time is the biggest advantage of this bow sight. Aligning the primary pin of the sight is done by virtually scoping in a pin and reticle. The virtual pin and reticle behave like they are on different focal planes and you have to aim and align them much as you would do with the open iron sights of a rifle. The red pin is visible when ranging and functions as a rear iron sight on a rifle barrel. The green reticle behaves like a front sight 0.5 meters into the far field. A graphical interface with aiding arrows guides you to align the two points, aim and adjust. A few things need mentioning though. The reticle and the small green arrows, which indicate the direction you should dial the sight, are not easy to see in direct sunlight. I wish that they had made the red pin and the green circle slightly bigger. And while you normally would be able to change the bow sight without moving your peep sight, I had to move my peep sight 2-3 mm down to make it all work. After having adjusted the primary pin you can carry on with sighting in your arrows on different ranges. This was a very easy process. The Xero guides you with questions and all you have to do is answer them and adjust your bow sight via the small screen’s interface and buttons. The more pins you calibrate on various distances in this process, the more accurate the sight is able to predict your bow’s speed and arrow’s flight and the more accurate your future pins will be. I quickly became very fond of the bow sight shooting experience and could see that my groups immediately began to look a lot nicer. You can shoot at very long distances and be pretty accurate. I have shot at 60 metres with it on several occasions and can hold groups of 6-10cm. Unfortunately, my vision isn’t once what it was which has meant the pins on a regular multi-pin sight tend to blur together, making it straining to use. I was happy to experience that this wasn’t an issue at all with the Gamin Xero. All the usual clutter is gone. The technical design is very good, its big housing allows for a wide field of view and great light transmission. And along with only a single LED pin and a screen displaying all the information you need, it is a joy to use. These features also mean that the physical design is a bit bulky and heavy. Especially the mount to the bow is very thick. This will make your quiver hang further out from the bow if you have the quiver mounted on top of the bow sight mount. I was very interested in testing the angle compensation. From small angles to very steep angles. It works great! When making this review, I found that when you exceed around 25 degrees of an angle, the ballistic compensation is beginning to lose some of its accuracy. This issue should now be fixed with a firmware upgrade [v2.73]. Of course, with all things there can be an improvement. I had a few occasions where the display froze and didn’t respond when I pushed different buttons. I could then force it to shut down by holding the power button down for 30 seconds. It restarted right away and then it worked fine again. I am sure that this is also something Garmin can fix, if not already fixed, with a future software update. Taking other Garmin products into account, they are pretty reliable. Whether high tech watches, cameras, sat navs or any other of their products. The sight needs a better anti-reflective coating. Especially when light falls from behind the archer. I also found the ambient light sensor a bit confused. This sensor on the front of the sight measures incoming light to adjust the brightness of the display. Unfortunately, I found the display to adjust wrong once while target shooting, and once in the hunting blind. But after re-adjusting the brightness through the display menu, it all returned to appropriate levels. These are the only flaws I’ve been able to find while testing this innovative piece of bow-tech. I’m generally impressed with its sturdiness, precision and thought out functionality. I look forward to gaining more experience with it. 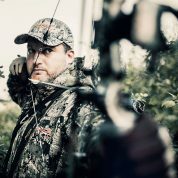 Make sure to see how the bow sight works in action on a hunt. Watch the short film above the article. In some countries, the use of electronic/digital bow sights is either regulated or entirely prohibited. You should always be aware of the current law and legislation before using this particular kind of bow sight.